Fed-Ex in the driveway… boxes in the garage… wife with a very dismayed look on her face… it must be another bike! It may seem from reading this blog that all I do is collect bikes. But this would be mistaken. As I mentioned a number of posts back, I've decided to focus my collecting/riding on small wheeled shoppers and folders from the 1960s and 1970s. There are just too many nice bikes out there, so discipline is essential. Even with the folders and shoppers, there are a ton out there, so my focus has become even tighter - BRITISH folders and shoppers from the 1960s and 1970s. I've had a number of RSW's come through my shop. My first ones were in pretty rough shape. I ended up selling them (wish I hadn't now, just as parts bikes, but I didn't have the space). I picked up a Flamenco Red one about 9 months later which I still have. It's a nice bike, but it was in pretty rough shape. Not a very nice example, but ridable and it all worked. A few months later, I got my first RSW Compact, again in pretty rough condition. It has since moved on too. I kept the carryall despite its horrible condition. Hoping to rebuild it. I am now realizing that I haven't done a post of the RSW Compact I got to take its place! So, about 4 months back, I came across a green RSW Compact in pristine shape. I'll need to do a post on it soon. Here are a couple pictures during the unboxing and unwrapping. The seller did a great job wrapping it up so no inadvertant scratches would appear. The paint and decals are in nearly mint condition. All the rubber and vinyl is still sound. There will be a good use for that bike shipping box too. I still have a few larger wheeled bikes to move on. Here is is all put together. Our dog, Hazel, can tell I'm thinking she might fit in that basket. "No way!" she says. Hazel is a Havanese, and, completely off topic, she's a great dog. Havanese are really great dogs if you are into smaller dogs. Anyway, the bike works, all of it. Lighting system, shifting, steering, wheel bearings. The only thing I can see that is wrong with it is the spring loaded rack. Typically the springs are inside a couple tubes and are held tight by the tension of the spring pulling against a small metal plug at the end of the tube. The plugs are gone and the prior owner stretched the spings and just hooked them onto another bar in the rack… it works, but its very sloppy. I'm going to see what I can do to get it back looking right. Front quarter view. Dynohub - no rust; wheel rims - no rust; Chrome headlight… perfect. Lokk at those pedals though! Warped as if from heat. Look at this thumb ringer bell! "Bill Glass Bicycle and Hobby Shop. Service on All Makes of Bikes" This thing is SOLID and the chrome plating is the best I've ever seen. Gorgeous. 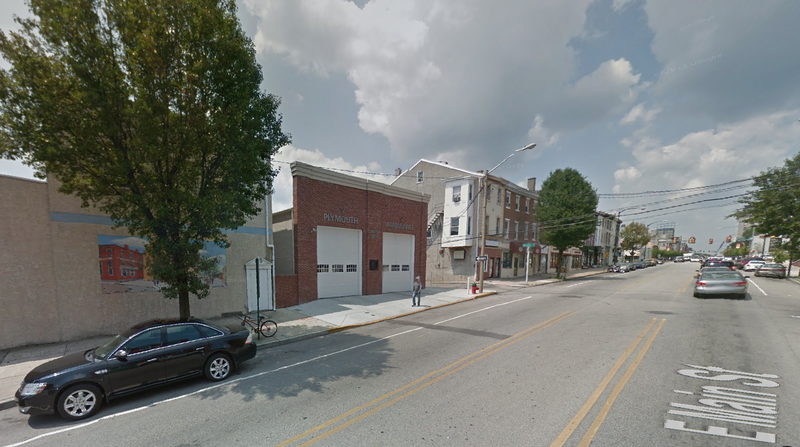 Here is 200 West Main, Norristown, PA now… Plymouth Ambulance seems to have taken over Bill Glass' place. At least there is a bike out front! So there she is. Hopefully, this is the last one. I've got good examples of the two primary bikes of this series. The plan is (currently) to clean up the Flamenco Red on and make it a rider. The two green ones will come out on sunny days. I still have my eyes open for a MarkII or MarkIII. I've heard the MarkIII has a longer head tube so it is better for taller riders. This might be worth looking into. Anyone? Wow, this is spectacular. Full of neat touches.